Fortress of Louisberg was France's jewel in the 18th century. Today it's Canada's treasure and North America's largest historical reconstruction of a fortress. Fortress of Louisbourg, Nova Scotia Canada. Here we discovered an 18th century adventure nestled on the edge of a continent, a place where muskets and mortars were fired. Women in hoop skirts and men in wigs recreated bygone life in a fort. There are town criers and the "iron collar" were a part of everyday life, it's a lot of fun and a must see. The site is over 12 acres with 50 plus buildings, so plan to spend the whole day. Here again if you have a yearly pass to the National Parks of Canada, this visit is free, just bring your pass in. When you arrive, your first stop is the Visitor Center. This is located just beyond the modern town of Louisbourg. Here you can browse the display center and gather tons of information. After that, you take a seven minute bus ride from the Visitor Center to the Fortress. There are several buses shuttling back and forth. Don't forget to bring your camera, comfy shoes and warm clothing, it does get windy at times and the fog can roll in very quickly. Get ready, set, go and step back in time to 1744. Experience Louisbourg, a thriving seaport and capital of Île Royale of Cape Breton Island. The Fortress of Louisbourg was one of the busiest harbours in North America and one of France's key centres of trade and military strength in the "New World". Today, the site is a fascinating, exciting and entertaining lesson in history. Actors in one of the buildings.... Just wonderful. There was at least one place open to eat at, just like in the 1700's. 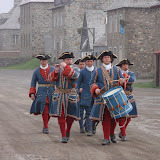 For more pictures from the Fortress of Louisbourg, check out our Picasa Web Album. Just click the image below. Fortress of Louisbourg is now on my Bucket List. It is so well restored/preserved. The sea and the fog are amazing especially when the scene changes so quickly. So much to see and remember you'll have to do it again!!! I'll stow away in the cupboard!